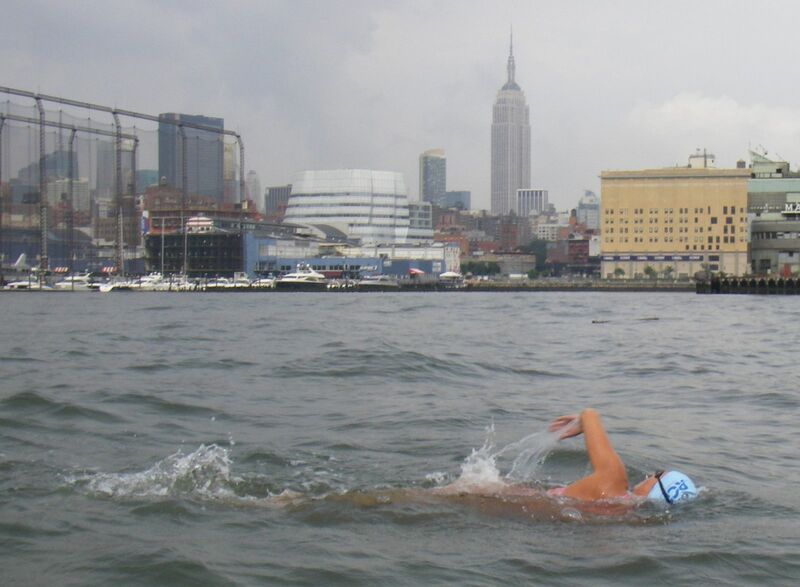 Every year I accompany in my kayak the swimmers that circle Manhattan in the annual Manhattan Island Marathon Swim. 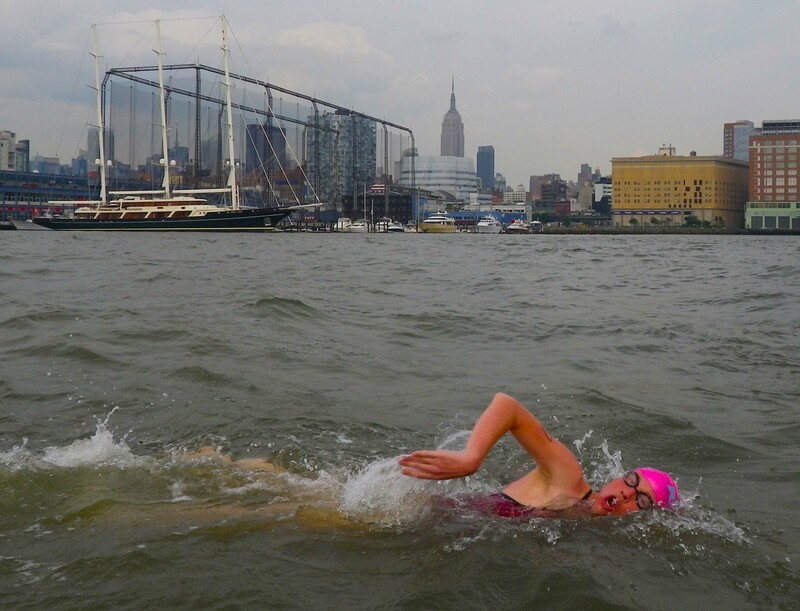 During this 7- or 8-hour-long race, I have plenty of opportunity to pair in my photos the swimmer in the foreground, just a few feet from my kayak, with various New York City landmarks in the distance. And there is a particular spot in the Hudson River, with just a few miles left to go, where the landmark is the Empire State Building. I never fail to take a photo there! Here are the photos from three different years. More photos are here, here, and here. A second response to the challenge is here. This entry was posted in Kayaking, Photography, Sports and tagged Long-Distance Swim, Manhattan Island Marathon Swim, Near and Far, New York Harbor, Photography, postaday, postaweek, postaweek2012, Weekly Photo Challenge. Bookmark the permalink. Great photos. I often stand on my balcony, amazed at the stamina of some of these swimmers. Every weekend, and days during half terms, I see swimmers going up and down the bay here for hours. I don’t know if they are training to swim the channel or some other reason, but they just keep going in all weathers. I’d have to photo-shop the swimmers in to get that kind of photo! Nice photos that I’m sure the swimmers appreciate! Many thanks for the pingback, I appreciate it. Really cool entry! I’ve done a marathon but it was only a little less than four hours nothing like 7-8 hours of swimming open water! Wow! Great of you to help out too. Great shots! Do you make them available to the swimmers? I get one per year! Great shots – interesting how the Empire State Building and Frank Gehry’s iconic glass building in Chelsea are part of all 3 pictures! 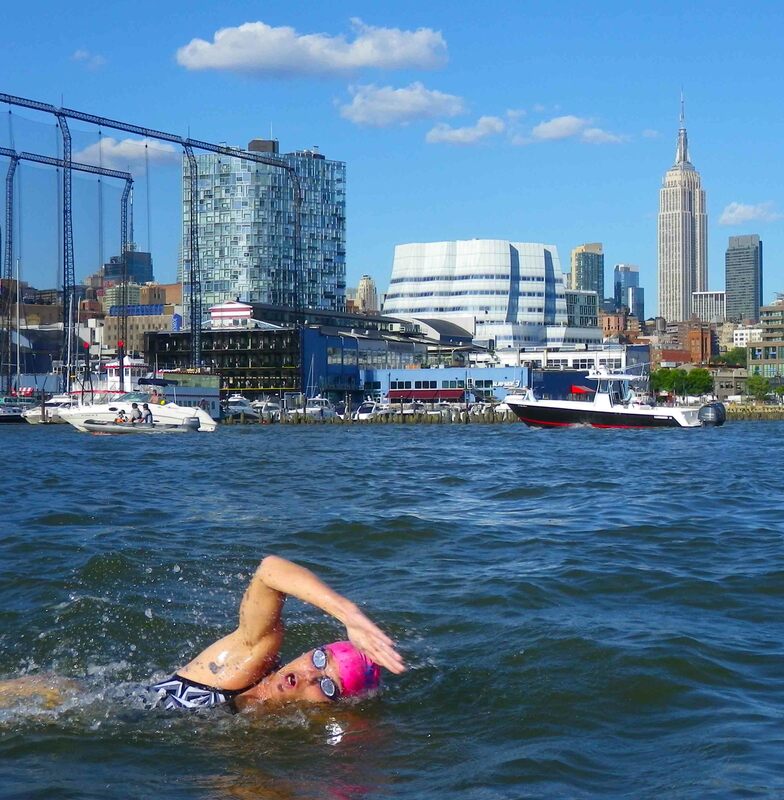 “Every year I accompany in my kayak the swimmers that circle Manhattan…” great job, congrats! Thanks! I’ve written up the experience here and here. You provide a huge service to those athletes. I’m sure it’s amazing to see it all from that vantage point too. Nice shots! It’s quite a day… see the links in my response to frizztext’s comment above. Ooooh.. Your reply to Johna put chills through my body. For sure you would note the subtle changes not only in your photos but also in our world’s oceans. The Ice melt data is scary. Incredible photos, love your interpretation of the near and far theme,!Thank you for stopping by and checking out mine! Have a fantastic Saturday! G.
You too—thanks for stopping by! Some very unique photographs of swimmers! Just perfect for Near and Far! Love the idea of the photo across the years – god, what a grueling swim – even the kayaking has got to be a challenge. I wonder if I ever saw you as I rode the SI Ferry? (Ohhh, I love the Gehry building!) Thanks for including me on your list! The main challenge in kayaking with the swimmers is being able to sit in the boat that long. There’s no serious paddling involved—even though the swimmers are amazing, and many of them are world-class open-water swimmers, they still swim considerably slower than a kayaker would normally paddle. If you take the Staten Island Ferry, you might well see us. We’ve certainly tangled with it often enough! You are TINY compared to that boat! I’ve moved to the Seattle area, so no more ferries, but what a fantastic way to commute, overall. Good for you for learning to listen to yourself & separate the real from the imaginary. Thanks for stopping by l♥v your photos. great captures! as a side note, it is interesting to see how the weather differs from year to year. thanks for sharing. Yes, the weather is the wild card in the race. In most years, the weather on the day turns out to be typical NYC summer weather—hot (although not as hot as it will be later in July and August), humid, with afternoon thunderstorms. The thunderstorms have turned out to be a serious problem several times—the race had to be stopped and restarted, and one year actually canceled half-way through. Love your shots, and thanks for the ping! You are most welcome, and thanks! Lovely pictures! Thank you for the pingback! Thank you—your photo is great for the challenge! Perfect response, Vlad – but tell me, what is that cage, to the left? Is it for lifting boats out of the water? Great shots. I love that you take them every year , it must make a cool slide show. That’s simply awesome! Can never get enough of the city … whew! !